With the start of the second phase of consultation on the proposed Thames Tunnel, Thames Water has announced that Deptford Church Street is now its preferred site for construction of an interception chamber to connect with the Greenwich storm relief combined sewer overflow. 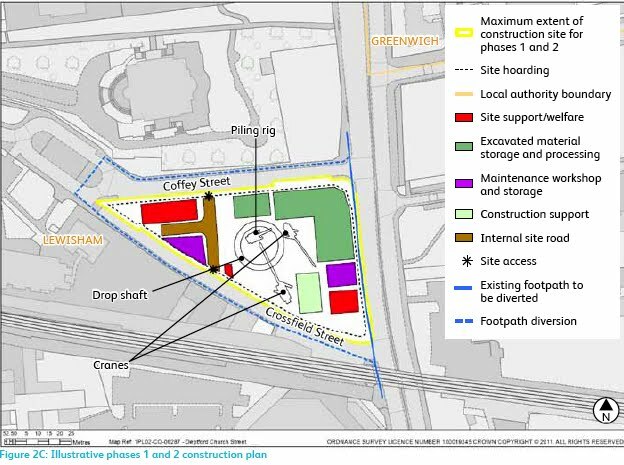 In brief, this involves the land adjacent to St Pauls (bounded by Coffey Street, Crossfields St and Deptford Church St) being used to construct a 17m-wide shaft. This shaft will allow sewage which currently overflows into the Thames to be intercepted and diverted to the Thames Tunnel for transfer to treatment plants. Although this land is stated in Thames Water's documentation to have no formal leisure use, its a classification that fails to recognise the site's importance as one of the few green open areas close to Deptford High Street. Once work is completed and the shaft covered in, there will be permanent structures left on the site - a number of ventilation columns and a 'kiosk' which will house the controls for underground equipment. The kiosk will be 2.5m high (about 8ft). The columns vary depending on which of Thames Water's documents you read - either three ventilation columns, two 4m high and one 6m high, or four ventilation columns up to 6m high and a small diameter column (described as similar to a lamp post) up to 6m high. 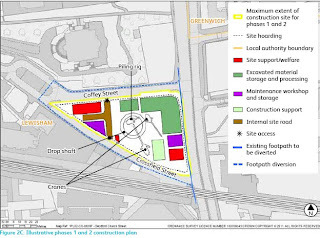 Aside from the loss of the land and everything on it, the plans will impact in other ways on Deptford, and the documents available give some indication of this. According to the plans, the construction work will take about three and a half years; during phase two (the shaft construction, which will take about a year), some 24 lorries a day are expected to visit the site to carry out spoil removal and deliver materials. During phase three (a period of about 18 months) the northbound half of Deptford Church Street will be closed to traffic while the underground interceptor chamber is constructed. Two-way traffic will be introduced on the southbound side of the road, although details about how this will be managed are so far sketchy. 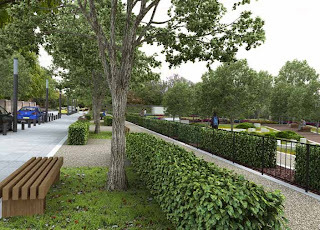 The documents online (see link below) include some renderings of what Thames Water intends to do with the land after the construction works - they propose to landscape it and return it as a public space with gardens, lots more trees, benches etc. This rendering shows the proposed view along Coffey St, with St Pauls on the left, just out of view. 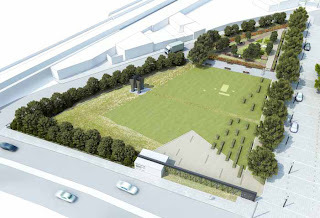 This aerial render shows the proposed site with ventilation columns in grey on the left, and the kiosk in the foreground on Deptford Church St.
Local campaign group Don't Dump on Deptford's Heart is hosting a meeting about the proposals, at which Phil Stride - head of Tideway Tunnels at Thames Water - will present the plans and answer questions about them. The meeting will take place on Tuesday the 15th November between 7.30pm and 9pm at the Salvation Army Hall on Mary Ann Gdns, SE8 3DP. Full information and documents are available here.